The website ASP.NET Social Networking developed using ASP.NET and SQL Server will be used to connect the people in very easy , simple and efficient way and one can share their feeling ,information ,ideas…..and many more…, the services offered to an individual’s choice(s) and availability for making friends among various areas and destinations. A log concerning the registration and requests for friends and various other features by users are also maintained. The website will also provide benefits to verified user(s). The project’s objective is to enable users to communicate with other people. It allows the user to search for friends. This website provides user the ability to upload the photographs. It also enables the user to leave the scraps & send the testimonials. REGISTER TO BE A MEMBER: Visitor can register to the social networking by entering their main profile details. 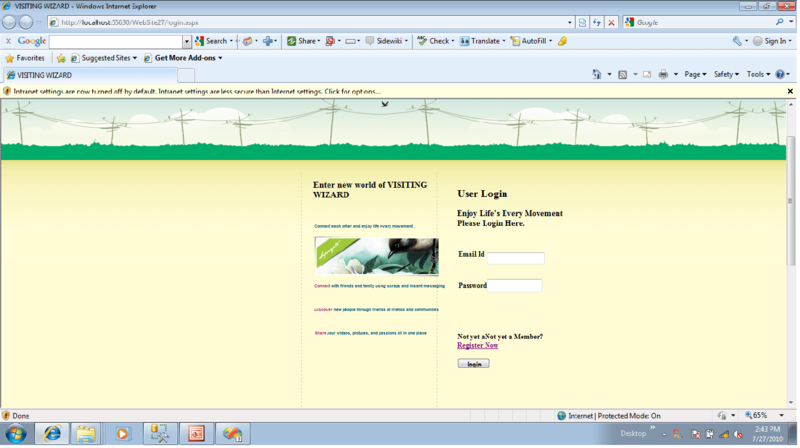 After the registration user will get login id and password. Logged users can EDIT their PROFILE, and upload the photographs. PROFILE: Logged users can see their details and if they wish to change any of their information they can edit it. The user can upload their profile pic in this module. FRIENDZ: Logged users can see their friend list and if they wish to add friendz. SCRAPBOOK: This module enables the user to send the scarps to their friendz. TESTIMONIAL: This module enables the user to send the testimonial to their friendz. PHOTO GALLERY: This module enables the user to upload the photos to their photogallery and mentain their album.